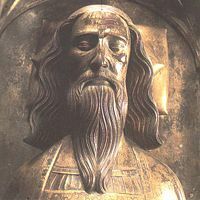 Edward III (November 13, 1312 – June 21, 1377) was one of the most successful English monarchs of the Middle Ages. Restoring royal authority after the disastrous reign of his father, Edward II, he went on to transform the Kingdom of England into the most efficient military power in Europe. His reign saw vital developments in legislature and government—in particular the evolution of the English parliament—as well as the ravages of the Black Death. He remained on the throne for 50 years; no English monarch had reigned for as long since Henry III, and none would again until George III. Edward was crowned at the age of 14, following the deposition of his father. When 17 years old he led a coup against his regent, Roger Mortimer, and began his personal reign. After defeating, but not subjugating, the Kingdom of Scotland, he declared himself rightful heir to the French throne in 1337, starting what would be known as the Hundred Years' War. Following some initial setbacks, the war went exceptionally well for England; the victories of Crécy and Poitiers led up to the highly favorable Treaty of Brétigny. Edward’s later years, however, were marked by international failure and domestic strife, largely as a result of his inertia and eventual bad health. Edward III was a temperamental man, but also capable of great clemency. He was, in most ways, a conventional king, mainly interested in warfare. Highly revered in his own time and for centuries after, Edward was denounced as an irresponsible adventurer by later Whig historians. This view has turned, and modern historiography credits him with many achievements, especially with strengthening English identity and giving Parliament more scope. His need to raise money to pay for his war in Europe actually meant that he listened with sympathy to his subjects' petitions. He knew, too, that whether he liked it or not, he could not rule without Parliament's support. Parliament had made him king, so Parliament could also depose him, as it had his father. Edward was born at Windsor on November 13 1312, and was thus called "Edward of Windsor" in his early years. 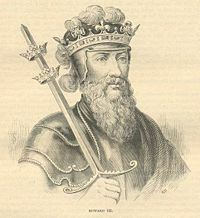 The reign of his father, Edward II, was fraught with military defeat, rebellious barons and corrupt courtiers, but the birth of a male heir in 1312 temporarily strengthened Edward II's position on the throne. To further this end, in what was probably an attempt by his father to shore up royal supremacy after years of discontent, Edward was created Earl of Chester at the age of only 12 days, and was given a full household of servants for his court, so he could live as if he were a full adult Nobleman independently of his father, less than two months later. On January 20, 1327, when the young Edward was 14 years old, the king was deposed by his queen, Isabella, and her consort Roger Mortimer. Edward, now Edward III, was crowned on February 1, and a regency was set up for him, led by Isabella and Mortimer. Mortimer, the de facto ruler of England subjected the young king to constant disrespect and humiliation. Mortimer knew his position was precarious, especially after Edward and his wife, Philippa of Hainault (June 24, 1311 – August 15, 1369), had a son on June 15, 1330. Mortimer used his power to acquire a number of noble estates and titles, many of them belonging to Edmund FitzAlan, 9th Earl of Arundel. FitzAlan, who had remained loyal to Edward II in his struggle with Isabella and Mortimer, had been executed on November 17, 1326. However Mortimer's greed and arrogance caused him to be hated by many of the other nobles. All this was not lost on the young king. Shortly before his eighteenth birthday, Edward, with the help of a few trusted companions, staged a coup d'état at Nottingham castle (October 19, 1330), resulting in the arrest of both his mother Isabella and Mortimer. Mortimer was sent to the Tower of London, and hanged a month later. Isabella was forced into retirement at Castle Rising. With this dramatic event, the personal reign of Edward effectively began. Edward chose to renew the military conflict with the Kingdom of Scotland in which his father and grandfather had engaged with varying success. Edward repudiated the Treaty of Northampton that had been signed during the regency, thus renewing claims of English sovereignty over Scotland and resulting in the Second War of Scottish Independence. Intending to regain what the English had conceded, he won back control of Berwick and secured a decisive English victory at the Battle of Halidon Hill in 1333 against the forces of the infant David II of Scotland. 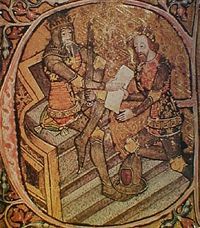 Edward III was now in a position to put Edward Balliol on the throne of Scotland and claim a reward of 2,000 librates of land in the southern counties - the Lothians, Roxburghshire, Berwickshire, Dumfriesshire, Lanarkshire and Peebleshire. Despite the victories of Dupplin and Halidon, the Bruce party soon started to recover and by the close of 1335 and the Battle of Culblean, the Plantagenet occupation was in difficulties and the Balliol party was fast losing ground. At this time, in 1336, Edward III's brother John of Eltham, Earl of Cornwall died. John of Fordun's Gesta Annalia is alone in claiming that Edward killed his brother in a quarrel at Perth. Although Edward III committed very large armies to Scottish operations, by 1337 the vast majority of Scotland had been recovered for David II, leaving only a few castles such as Edinburgh, Roxburgh and Stirling in Plantagenet possession. These installations were not adequate to impose Edward's rule and by 1338/9 Edward had moved from a policy of conquest to one of containment. Edward's military problems, however, were on two fronts; the challenge from the French monarchy was of no less concern. The French represented a problem in three areas: first, they provided constant support to the Scottish through the Franco-Scottish alliance. Philip VI protected David II in exile, and supported Scottish raids in Northern England. Second, the French attacked several English coastal towns, leading to rumors in England of a full-scale invasion. Finally, the English king's possessions in France were under threat—in 1337, Philip VI confiscated the duchy of Aquitaine and the county of Ponthieu. Instead of seeking a peaceful solution to the conflict by paying homage to the French king, Edward laid claim to the French crown as the only living male descendant of his deceased maternal grandfather, Philip IV. The French, however, invoked the Salic law of succession and rejected the claim, pronouncing Philip IV's nephew, Philip VI, the true heir (see below) and thereby setting the stage for the Hundred Years' War. In the war against France, Edward built alliances and fought by proxy through minor French princes. In 1338, Louis IV named him vicar-general of the Holy Roman Empire, and promised his support. These measures, however, produced few results; the only major military gain made in this phase of the war was the English naval victory at Sluys on June 24, 1340, where 16,000 French soldiers and sailors died. Meanwhile, the fiscal pressure on the kingdom caused by Edward's expensive alliances led to discontent at home. In response he returned unannounced on November 30, 1340. Finding the affairs of the realm in disorder, he purged the royal administration. These measures did not bring domestic stability, however, and a standoff ensued between the king and John Stratford, the Archbishop of Canterbury. Edward, at the Parliament of England of April 1341, was forced to accept severe limitations to his financial and administrative prerogatives. Yet, in October of the same year, the king repudiated this statute, and Archbishop Stratford was politically ostracized. The extraordinary circumstances of the 1341 Parliament had forced the king into submission, but under normal circumstances the powers of the king in medieval England were virtually unlimited, and Edward took advantage of this. After much inconclusive campaigning on Continental Europe, Edward decided to stage a major offensive in 1346, sailing for Normandy with a force of 15,000 men. His army sacked the city of Caen and marched across northern France. On August 26 he met the French king's forces in pitched battle at Crécy and won a decisive victory. Meanwhile, back home, the returned David II was defeated and captured at the Battle of Neville's Cross on October 17. With his northern border pacified, Edward saw an opportunity to stage a major offensive against France and laid siege to the town of Calais. The town fell in August of 1347. After the death of the Holy Roman Emperor Louis IV in October of 1347 his son Louis V, Duke of Bavaria negotiated with Edward to compete against the new German king Charles IV, but Edward finally decided in May 1348 not to run for the German crown. In 1348, the Black Death struck Europe with full force, killing a third or more of England's population. This loss of manpower, and subsequently of revenues, meant a halt to major campaigning. The great landowners struggled with the shortage of manpower and the resulting inflation in labor cost. Attempting to cap wages, the king and parliament responded with the Ordinance of Labourers (1349) and the Statute of Labourers (1351). The plague did not, however, lead to a full-scale breakdown of government and society, and recovery was remarkably swift. In 1356, while the king was fighting in the north, his oldest son, the Black Prince, won a great victory at the Battle of Poitiers. Greatly outnumbered, the English forces not only routed the French but captured the French king, John II. After a succession of victories, the English held great possessions in France, the French king was in English custody, and the French central government had almost totally collapsed. Whether Edward's claim to the French crown originally was genuine or just a political ploy, it now seemed to be within reach. Yet a campaign in 1359, meant to complete the undertaking, was inconclusive. In 1360, therefore, Edward accepted the Treaty of Brétigny, whereby he renounced his claims to the French throne but secured his extended French possessions. While Edward's early reign had been energetic and successful, his later years were marked by inertia, military failure and political strife. The day-to-day affairs of the state had less appeal to Edward than military campaigning, so during the 1360s Edward increasingly relied on the help of his subordinates, in particular William Wykeham. A relative upstart, Wykeham was made Lord Privy Seal in 1363 and Lord Chancellor in 1367, though due to political difficulties connected with his inexperience the Parliament forced him resign to the chancellorship in 1371. Compounding Edward's difficulties were the deaths of his most trusted men, some from the 1361–1362 recurrence of the plague. William Montacute, Edward's companion in the 1330 coup, was dead by 1344. William de Clinton, who had also been with the king at Nottingham, died in 1354. One of the earls of 1337, William de Bohun, died in 1360, and the next year Henry of Grosmont, perhaps the greatest of Edward's captains, gave in to what was probably plague. Their deaths left the majority of the magnates younger and more naturally aligned to the princes than to the king himself. The king's second son, Lionel of Antwerp, attempted to forcefully subdue the largely autonomous Anglo-Irish lords in Ireland. The venture failed, and the only lasting mark he left were the suppressive Statutes of Kilkenny. In France, meanwhile, the decade following the Treaty of Brétigny was one of relative tranquillity, but on April 8, 1364 John II died in captivity in England, after unsuccessfully trying to raise his own ransom at home. He was followed by the vigorous Charles V, who enlisted the help of the capable Constable Bertrand du Guesclin. In 1369, the war started anew, and Edward's younger son John of Gaunt was given the responsibility of a military campaign. The effort failed, and with the Treaty of Bruges in 1375, the great English possessions in France were reduced to only the coastal towns of Calais, Bordeaux and Bayonne. Military failure abroad and the associated fiscal pressure of campaigning led to political discontent at home. The problems came to a head in the parliament of 1376, the so-called Good Parliament. The parliament was called to grant taxation, but the House of Commons took the opportunity to address specific grievances. In particular, criticism was directed at some of the king's closest advisers. Lord Chamberlain William Latimer and Lord Steward John Neville, 3rd Baron Neville de Raby were dismissed from their positions. Edward's mistress, Alice Perrers, who was seen to hold far too much power over the aging king, was banished from court. Yet the real adversary of the Commons, supported by powerful men such as Wykeham and Edmund de Mortimer, 3rd Earl of March, was John of Gaunt. Both the king and the Black Prince were by this time incapacitated by illness, leaving Gaunt in virtual control of government. Gaunt was forced to give in to the demands of parliament, but by its next convocation, in 1377, most of the achievements of the Good Parliament were reversed. Edward himself, however, did not have much to do with any of this; after around 1375 he played a limited role in the government. Around September 29, 1376 he fell ill with a large abscess. After a brief period of recovery in February, the king died of a stroke at Sheen on June 21. He was succeeded by his ten-year-old grandson, King Richard II of England, son of the Black Prince, since the Black Prince himself had died on June 8, 1376. The middle years of Edward's reign was a period of significant legislative activity. Perhaps the best known piece of legislation was the Statute of Labourers of 1351, which addressed the labor shortage problem caused by the Black Death. The statute fixed wages at their pre-plague level and checked peasant mobility by asserting that lords had first claim on their men's services. In spite of concerted efforts to uphold the statute, it eventually failed due to competition among landowners for labor. The law has been described as an attempt "to legislate against the law of supply and demand," making it doomed to failure. Nevertheless, the labor shortage had created a community of interest between the smaller landowners of the House of Commons and the greater landowners of the House of Lords. The resulting attempts at suppression of the labor force angered the peasants, leading to the Peasants' Revolt of 1381. The reign of Edward III coincided with the so-called Babylonian Captivity of the papacy at Avignon. During the wars with France, opposition emerged in England against perceived injustices by a papacy largely controlled by the French crown. Heavy papal taxation of the English Church was suspected to be financing the nation's enemies, while the practice of provisions—the Pope providing benefices for clerics, often non-resident aliens—caused resentment in an increasingly xenophobic English population. The statutes of Provisors and Praemunire, of 1350 and 1353 respectively, aimed to amend this by banning papal benefices, as well as limiting the power of the papal court over English subjects. The statutes did not, however, sever the ties between the king and the Pope, who were equally dependent upon each other. It was not until the Great Schism in 1378 that the English crown was able to free itself completely from the influence of Avignon. Other legislation of importance includes the Treason Act of 1351. It was precisely the harmony of the reign that allowed a consensus on the definition of this controversial crime. Yet the most significant legal reform was probably that concerning the Justices of the Peace. This institution began before the reign of Edward III, but by 1350, the justices had been given the power not only to investigate crimes and make arrests, but also to try cases, including those of felony. With this, an enduring fixture in the administration of local English justice had been created. Parliament as a representative institution was already well established by the time of Edward III, but the reign was nevertheless central to its development. Parliament's role in deposing Edward II and in confirming Edward III's own succession, had also strengthened its authority. During this period membership in the English baronage, formerly a somewhat indistinct group, became restricted to those who received a personal summons to parliament. This happened as parliament gradually developed into a bicameral institution. Yet it was not in the House of Lords, but in the House of Commons that the greatest changes took place. The widening of political power can be seen in the crisis of the Good Parliament, where the Commons for the first time—albeit with noble support—was responsible for precipitating a political crisis. In the process, both the procedure of impeachment and the office of the Speaker were created. Even though the political gains were of only temporary duration, this parliament represented a watershed in English political history. The political influence of the Commons originally lay in its right to grant taxes. The financial demands of the Hundred Years' War were enormous, and the king and his ministers tried different methods of covering the expenses. The king had a steady income from crown lands, and could also take up substantial loans from Italian and domestic financiers. To finance warfare on Edward III's scale, however, the king had to resort to taxation of his subjects. Taxation took two primary forms: levy and customs. The levy was a grant of a proportion of all moveable property, normally a tenth for towns and a fifteenth for farmland. This could produce large sums of money, but each such levy had to be approved by parliament, and the king had to prove the necessity. The customs therefore provided a welcome supplement, as a steady and reliable source of income. An 'ancient duty' on the export of wool had existed since 1275. Edward I had tried to introduce an additional duty on wool, but this unpopular maltolt, or 'unjust exaction', was soon abandoned. Then, from 1336 onwards, a series of schemes aimed at increasing royal revenues from wool export were introduced. After some initial problems and discontent, it was agreed through the Ordinance of the Staple of 1353 that the new customs should be approved by parliament, though in reality they became permanent. Through the steady taxation of Edward III's reign, parliament—and in particular the Commons—gained political influence. A consensus emerged that in order for a tax to be just, the king had to prove its necessity, it had to be granted by the community of the realm, and it had to be to the benefit of that community. In addition to imposing taxes, parliament would also present petitions for redress of grievances to the king, most often concerning misgovernment by royal officials. This way the system was beneficial for both parties. Through this process the Commons, and the community they represented, became increasingly politically aware, and the foundation was laid for the particular English brand of constitutional monarchy. Central to Edward III's policy was reliance on the higher nobility for purposes of war and administration. While his father had regularly been in conflict with a great portion of his peerage, Edward III successfully created a spirit of camaraderie between himself and his greatest subjects. Both Edward I and Edward II had conducted a policy of limitation, allowing the creation of few peerages during the sixty years preceding Edward III's reign. The young king reversed this policy when, in 1337, as a preparation for the imminent war, he created six new earls on the same day. At the same time, Edward expanded the ranks of the peerage upwards, by introducing the new title of duke for close relatives of the king. Furthermore, Edward bolstered the sense of community within this group by the creation of the Order of the Garter, probably in 1348. A plan from 1344 to revive the Round Table of King Arthur never came to fruition, but the new order carried connotations from this legend by the circular shape of the garter. Polydore Vergil tells of how the young Joan of Kent, Countess of Salisbury —the king's favorite at the time—accidentally dropped her garter at a ball at Calais. King Edward responded to the ridicule of the crowd by tying the garter around his own knee with the words honi soit qui mal y pense—shame on him who thinks ill of it. This reinforcement of the aristocracy must be seen in conjunction with the war in France, as must the emerging sense of national identity. Just like the war with Scotland had done, the fear of a French invasion helped strengthen a sense of national unity, and nationalize the aristocracy that had been largely Anglo-French since the Norman conquest. Since the time of Edward I, popular myth suggested that the French planned to extinguish the English language, and like his grandfather had done, Edward III made the most of this scare. As a result, the English language experienced a strong revival; in 1362, a statute ordered the English language to be used in law courts and, the year after, Parliament was for the first time opened in English. At the same time, the vernacular saw a revival as a literary language, through the works of William Langland, John Gower and especially Canterbury Tales by Geoffrey Chaucer. Yet the extent of this Anglicization must not be exaggerated. The statute of 1362 was in fact written in the French language and had little immediate effect, and parliament was opened in that language as late as 1377. The Order of the Garter, though a distinctly English institution, included also foreign members such as the John V, Duke of Brittany and Sir Robert of Namur. Edward III—himself bilingual—viewed himself as legitimate king of both England and France, and could not show preferential treatment for one part of his domains over another. Influential as Stubbs was, it was long before this view was challenged. In a 1960 article, titled "Edward III and the Historians," May McKisack pointed out the teleological nature of Stubbs judgement. A medieval king could not be expected to work towards the future ideal of a parliamentary monarchy; rather his role was a pragmatic one—to maintain order and solve problems as they arose. At this, Edward III excelled. Edward had also been accused of endowing his younger sons too liberally and thereby promoting dynastic strife culminating in the Wars of the Roses. This claim was rejected by K.B. McFarlane, who argued that this was not only the common policy of the age, but also the best. Later biographers of the king such as Mark Ormrod and Ian Mortimer have followed this historiographical trend. From what we know of Edward's character, he could be impulsive and temperamental, as was seen by his actions against Stratford and the ministers in 1340–41. At the same time, he was well-known for his clemency; Mortimer's grandson was not only absolved, but came to play an important part in the French wars, and was eventually made a knight of the Garter. Both in his religious views and his interests, he was a conventional man. His favourite pursuit was the art of war, and, as such, he conformed to the medieval notion of good kingship. He seems to have been unusually devoted to his wife, Queen Philippa. Much has been made of Edward's sexual licentiousness, but there is no evidence of any infidelity on the king's part before Alice Perrers became his lover, and, by that time, the queen was already terminally ill. This devotion extended to the rest of the family as well; in contrast to so many of his predecessors, Edward never experienced opposition from any of his five adult sons. On the other hand, Edward did give impetus to an increase in Parliament's role in governance, even if his deference to Parlimant was pragamatic rather than ideological, and his contribution to a distinct sense of English identity have attracted the title, "father of the English nation.". Arms of Edward III and his sons, Trinity College Cambridge. ↑ For an account of Edward II's later years, see Natalie Fryde. The Tyranny and Fall of Edward II, 1321–1326. (Cambridge: Cambridge University Press, 1979. ISBN 052122201X). ↑ Ian Mortimer. The Perfect King: The Life of Edward III, Father of the English Nation. (London: Jonathan Cape, 2006. ISBN 022407301X), 1. ↑ W. M. Ormrod. The Reign of Edward III. (New Haven, CT: Yale University Press, 1990), 6. ↑ Ormrod: 1990, p 9. ↑ N.M. Fryde, (1978), "Edward III's removal of his ministers and judges, 1340–1," British Institute of Historical Research 48: 149–161. ↑ Ormrod, Reign of Edward III, 16. ↑ May McKisack. The Fourteenth Century: 1307–1399. (Oxford: Oxford University Press, 1959. ISBN 0198217129132). ↑ J. Hatcher, (1977). Plague, Population and the English Economy, 1348–1530. (London: Macmillan. ISBN 0333212932). ↑ N.C. Prestwich. Plantagenet England: 1225–1360. (Oxford: Oxford University Press, 2005. ISBN 0198228449), 553. ↑ For a discussion of this question, see Prestwich, 2005, 307–310. ↑ Ormrod, 1990, 90–94; W. M. Ormrod, "Edward III (1312–1377)” in Oxford Dictionary of National Biography. (Oxford: Oxford University Press, 2004. ISBN 019861411X). ↑ Ormrod, 1990, 35–37; McKisack, 1959, 387–394. ↑ The earlier belief that Gaunt "packed" Parliament in 1377 is no longer widely held. See J.C. Wedgewood. "John of Gaunt and the packing of parliament," English Historical Review 45(1930): 623–625. ↑ B. Hanawalt. The Ties That Bound: Peasant Families in Medieval England. (Oxford: Oxford University Press, 1986. ISBN 0195036492), 139. ↑ M. Prestwich, (1981). "Parliament and the community of the realm in the fourteenth century," in Art Cosgrove and J.I. McGuire, (eds.) Parliament & Community. (Belfast: Appletree Press, 1983. ISBN 9780904651935), 20. ↑ A. Musson and W. A. Ormrod. The Evolution of English Justice. (Basingstoke: Macmillan, 1999. ISBN 033367670X), 50–54. ↑ A. L. Brown. The Governance of Late Medieval England 1272–1461. (London: Edward Arnold, 1989. ISBN 0804717303), 70–71. ↑ Brown, 1989, 67–69, 226–228. ↑ G.L. Harriss. King, Parliament and Public Finance in Medieval England to 1369. (Oxford: Oxford University Press, 1975. ISBN 0198224354) 509–517. ↑ K. B. McFarlane. The Nobility of Later Medieval England. (Oxford: Clarendon Press, 1973. ISBN 0198223625), 158-159. ↑ McKisack, 1959, 251-252. Another candidate for the owner of the original garter was her mother-in-law Catherine Grandisson, the Dowager Countess of Salisbury. ↑ McKisack, 1959, 253; Prestwich, 2005, 554. ↑ William Stubbs. The Constitutional History of England in its origin and development, second ed. (London: 1878), quoted in May McKisack, "Edward III and the historians." History 45 (1960): 3. ↑ K. B. McFarlane. England in the fifteenth century. (London: Hambledon Press, 1981. ISBN 0950688258), 238. ↑ Ormrod, 1990, 44; Prestwich, 2005, 290–291. ↑ Mortimer, 400–401; Prestwich, 1980, 241. Barber, Richard, "Edwards III's Round Table," History Today 57 (8)(Aug 2007): 12-18. Brown, C. The Second Scottish War of Independence. Charleston, SC: Tempus ISBN 9780752423128. Fryde, N.M., "Edward III's removal of his ministers and judges, 1340–1," British Institute of Historical Research 48 (1978): 149–161. Nicholson, R. Edward III and The Scots. Oxford: Oxford University Press, 1965. Stubbs, William, Abbott. The Constitutional History of England in its origin and development, second ed. London: 1878. History of "Edward III of England"
This page was last modified on 22 September 2017, at 20:34.